The diagram shown above is the prototype for my Capstone, created in the beginning stages of my planning. My audience is fellow educators and administrators. I chose to use Coggle because it mimicked a mind map and was easy for my brains way of thinking. I hope you can follow it easily. Below were the concrete things I knew for certain during my planning. I know there is a need at my site for training on digital citizenship and tech standards. I know that not all teachers will jump on board. I know that it’s challenging to take technology and content and make meaning out of it all and tie it together with 21st Century skills. I know many teachers will be excited to learn new ways of doing things in the classroom. I know that I’m excited to share what I have learned! I know that using a class blog motivated my students and showed higher engagement in independent reading. I used logomakr.com to create my logo. First, I came up with the play on words, "Diving into Digital Tools" and wanted to use ocean waves inside the computer. Then, after getting feedback from my cohort, I changed it to add a diver inside the computer. Below are a couple of my first attempts at making my logo. It was an engaging process that I spent a lot of time on because it was fun! I played with different icons, colors, and fonts. I didn't want it to be too busy, and am very happy in the end. The analysis of challenges and opportunities related to my project are seen in this document, known as the "SITE model description." Before designing this project it was crucial to think through the needs of my learners. This document analyzes the needs of my audience through the sociocultural context, technical context, informational, and educational lens. Connectivity to the learner is key in designing a presentation or lesson. It is important to know the needs of your learners. Of the SITE models we presented and discussed in class, ARCS (Attention, Relevance, Confidence, Satisfaction) was the most familiar model for me. I could relate to this model with my own teaching. I made an immediate connection to the GLAD model. When it comes to being innovative and thinking “outside the box” I think of that as great teaching. For so many years, though, that was completely squashed out of teachers with NCLB. During that time I remember feeling as though the creativity in me had been put in a box! It’s important to show students various ways of doing something, whether it be a project or a basic math problem. We have to help them become “outside the box” thinkers so that they realize the one size fits all approach does not apply to teaching and learning. 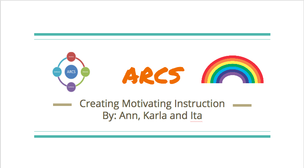 To learn more about the ARCS instructional model please use the image above to view a presentation my colleagues and I have prepared.